Moods Uomo opens with heavy-duty aldehydes, sour greens (there's a wormwood-like note), and citrus peels. Moods' opening notes keep percolating as others join in: a tough-broad rose dusted with lily of the valley-scented powder and a few jasmine blossoms tucked in her fleshy petals; there's an undercurrent of spicy, dark-red carnations, too. Oak moss appears in Moods Uomo's mid-development, and it's the real stuff, not fractioned, sanctioned or sacrificial (it stays the course, never disappears). Moods Uomo smells rich and "thick;" it's a perfect cool-weather perfume. Moods Uomo's base is lovely, a cedar-chest scent (a sensational-smelling "aged" cedar), with hints of leathery vanilla and tonka beans; the base notes meld to form a sturdy amber base (with added notes of dark patchouli and musk). In the extreme dry down, a cool, smooth clove note joins with the cedar for an original finish. Krizia Moods Uomo has great sillage and lasting power and it's...discontinued; it must have been manufactured in huge quantity or it's not popular because you can buy a bottle for under $20. Men, women *past, present or future* enjoy! 1. Listed notes: aldehydes, bergamot, lemon, lavender, coriander, cardamom, ginger, geranium, carnation, jasmine, lily of the valley, rose, tonka bean, amber, cedar, patchouli, musk, vanilla, oak moss. 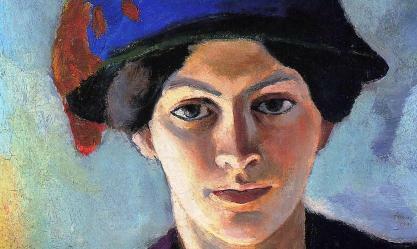 Note: top image is Portrait of the Artist's Wife with a Hat, 1909, by August Macke [cropped] via Wikimedia Commons. I bought Krazy Krizia unsniffed after a positive review or comment and liked it, so I’m game for a mini of this one, too. Here’s to gender bending! Noz, a mini must be almost free! Hi Kevin, I always wear my Krizia Uomo when I want a burst of pure 80’s pleasure. I must add that I have been wearing Krizia since 1986. I remember when Moods initially came out and how I always meant to purchase a bottle but so may other favorites always stole the allocated fragrance funds. I can not find the eau de toilette of Moods online, just the after shave. Maybe I will order that just to get an introduction to the fragrance. I am so glad that you fragrance maters on NST always review my old but goodies too. I buy many modern niche fragrances, however, my core collection is also still filled with the fragrances from my youth. Youth truly is wasted on the young. Lindeberg…I’m discovering lots of great vintage scents, too. In the last few years they make up most of my perfume purchases. I think I bought my bottle of Moods at eBay…. I’ve tried it again and still had the same reaction. The description sounds lovely but I guess if I am a glutton I should order another bottle and see how it behaves. Girard…i’ve been really lucky with discounters over the years…no spoilage, just one phoney scent in all these years. Bravo, Kevin. Another I’ve got to try. A potential period bookend to the old Azzaro Pour Homme. The vintage/historical aspect of NST invariably gets me going. I know you’re not afraid to write about old stuff, and the same applies to Jessica and Angela. Good on all of you. BTW: the Fiele line is something to be reckoned with, so thanks for that too. I’m still reckoning. I like the Viola, but they all demand to be heard. Thanks, Donnie…glad you liked the Fiele scents! I am no longer “young” at 42, at least for the perfume industry’s demographic target… but I love Krizia Moods Uomo. And I had forgotten about the “cedar chest” note. I really love that one. It reminded me of a cedar box in which my grandfather used to store all his finest fishing accessories (knives, hooks, special lines) all pristinely clean and with the smell of a neutral mineral oil to prevent rusting. In the late 80s and early 90s I also enjoyed Krizia’s Spazio for men too. Thank you Kevin this was a trip down memory lane! I hope younger people get to discover these frags.